Replies : TweetMyPC will reply to you after a command is executed. Replies will be in the form of Tweets. os : This is one of the command which does not have much value. Tweeting os will make TweetMyPC to tweet about your OS version. standby : Donâ€™t want to shutdown? then make you pc go to standby mode with this command. hibernate : hibernate your pc with a tweet. getprocesslist : This is one of the very useful command. On receiving this command TweetMyPC will generate a list of running programs, along with the process ID, and email it to a predefined email address. kill : This is used along with the above command. Once you recive the process list you can close a program using the kill command. download : Want to download an intresting video but you are on the move? donâ€™t worry just tweet download followed by the download url and TweetMyPC will download it for you and it will be ready when you return back. get : Missed an important document and you are travelinlg some where? No problem. Just tweet get followed by the file path and TweetMyPC will email the file as attachment to a predefined email. Donâ€™t know the path? dont worry. Just checkout the next command. getfilelist : This command will make TweetMyPC to send you the list of files and folders in a drive. You can use this command to email you a file once you know the complete path of the file. Custom Command : This is the most interesting feature of TweetMyPC. Do you think the above command are not enough? then create your own custom command. You can choose a comand and then chose a file to run. 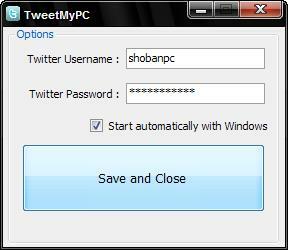 For example you can choose a command winamp and make TweetMyPC to run winamp by tweeting winamp. You just have to install the application on the target PC and enter your twitter credentials. No more complicated settings required. If you use your cellphone with twitter, you can do all these things by tweeting using your cell phone. Right now, only windows version is available. A Mac version would be out soon.